Makes the class go a lot smoother. We have a huge paper at the end of the semester, and this provided plenty of facts to help back it up. 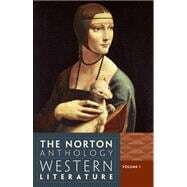 The Norton Anthology of Western Literature, Volume 1: 4 out of 5 stars based on 1 user reviews.